Ship Lapped Planks look great on walls and ceilings, they are best suited to be installed over existing drywall or wallboard. A ship lapped plank ⅜" thick, weighs less then tongue & groove planks that are ½" thick. 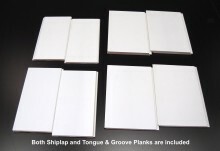 Elite Shiplap Planks are often use for wainscoting, if you are considering these planks for wainscoting, have a look at our pre-packaged kits. For ceilings, just calculate square footage. 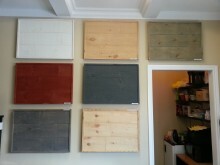 You will find the coverage listed for all of our planks online. As most ceilings are wider than eight feet, seams or joints should be taken into consideration. You have several options; bevel the ends and stagger the planks just like hardwood flooring or add beams to the ceiling and have a joints hidden by them. This not only hides the seams but adds a unique architectural detail. 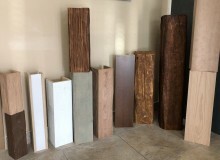 Our V-Grooved Planks have a deeper "V" groove often found only in tongue and grooved 1/2" or 5/8" thick planks. We use 3/8” thick stock to reduce weight well as shipping and material costs. 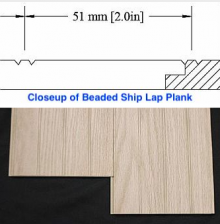 What are Nickel Gap Planks? They are boards that are milled to reveal a specific gap during application. 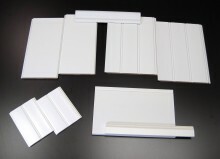 They are also referred as “Channel Beads” or Tongue & Groove boards. the name is derived from a process that carpenters used long ago were they placed a stack of nickels to insure the boards where nailed in place with a uniformed gap between them. For 2017, we have reintroduced eight types of Nickel Gap Planks.